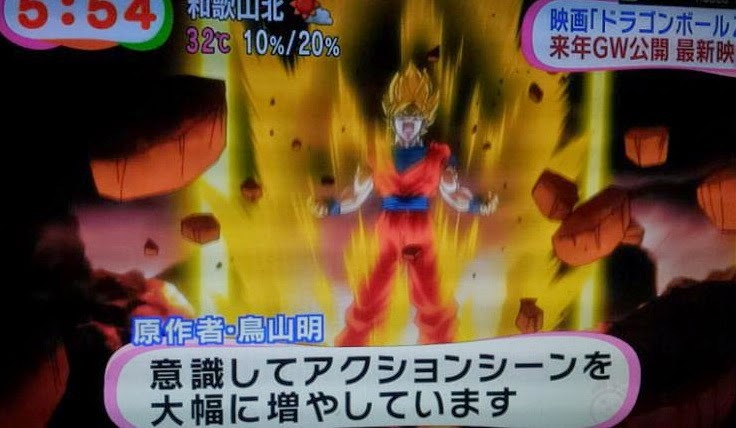 Fuji TV's morning program, Mezamashi TV recently aired teaser scenes for the new Dragon Ball movie that is slated to premier during the “Golden Week". Some of the key visuals shown are Son Goku transforming into a Super Saiyan, a different Dragon Ball fiery logo, and Shenlong appearing. Check out the coverage via Youtube after the jump. The latest issue of Jump magazine has revealed that Akira Toriyama is currently working on a new Dragon Ball movie slated for spring 2015 release. Toriyama has also confirmed that like Dragon Ball Z: Battle of God, this film will tell a new story set in the Dragon Ball universe. Toriyama is currently working on the new character designs, and asked his fans to look forward to the movie. Official title has yet to be announced.